To celebrate Mother’s Day and honor the influential women in your life, may I suggest serving Afternoon Tea? It’s a most civilized custom and has many entertaining applications. It could be just you and a friend in for a little gossip or a garden full of little girls in tiaras or a collection of your favorite mothers and daughters in a multi-generational Mother-Daughter Tea. Whichever you choose, we have the blueprint for success. First a little lingo. What most people call High Tea is actually Afternoon Tea. High Tea is a meal, like dinner with meat and potatoes. Not a scone in sight! Afternoon Tea is served usually between 2:00 and 4:00 and includes adorable little savory sandwiches, scones and petite sweets. How to make tea: The center of the whole ritual is the tea so making a really good cup is essential. It’s perfectly acceptable to use tea bags, but if you want to be fancy, use loose tea in a teapot. Bring fresh cold water to a rolling boil. Allow ¾ cup water per serving. Traditionally you’d add 1 teaspoon loose tea per serving plus one more teaspoon “for the pot.” Be sure to warm the teapot with hot water before adding the tea. Follow with boiling water and steep for 3-5 minutes. Use a tea strainer to serve. Serve your tea with sugar, cream and lemon slices (never serve cream and lemon together!) Accompany with beautiful trays of tea sandwiches, savory bites, scones with clotted cream and jam and lastly, tarts, cookies and other bite-sized sweets. What the heck is clotted cream? I wish it had a better name. It’s made by allowing some of the whey to drain from heavy cream, resulting in a sweet, creamy spread similar to soft cream cheese. 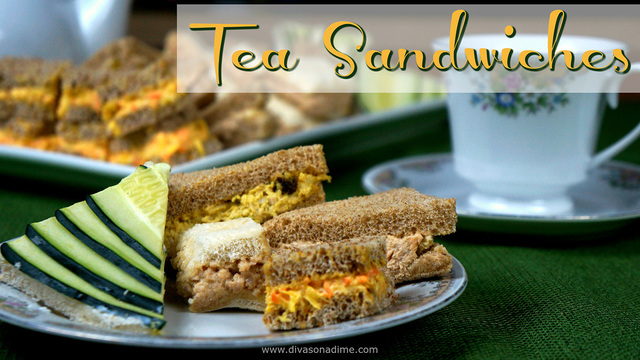 Tea Sandwiches are delicate crustless treats. Use thinly sliced white and wheat bread for color contrast. Remove the crusts but be sure to save them to make bread crumbs. Cut the prepared sandwiches into small squares or triangles. Here are some recipes for delicious sandwich fillings. Cucumber – Blend together 4 ounces cream cheese, ½ teaspoon dill, ½ teaspoon lemon juice. Spread on white bread and top with a layer of thinly sliced cucumber. Curried Chicken – Mix together 1 ½ cups diced or shredded cooked chicken, ½ cup sour cream or plain yogurt, 1 ½ teaspoons curry powder, ¼ cup raisins, 2 tablespoons thinly sliced green onion, ¼ cup diced celery. Pineapple Carrot Spread – Combine 4 ounces softened cream cheese with ½ cup diced fresh or canned crushed pineapple and ½ cup finely shredded carrot. Zesty Salmon – Combine 1 (14.75 oz.) can salmon – flaked with bone and skin removed, ½ cup mayonnaise, 1 tablespoon horseradish, 3 tablespoons minced dill pickle. When you invite your guests, ask: “Care to join me in a cup of tea?” If they don’t answer, “Do you think there’s room?” find funnier friends.